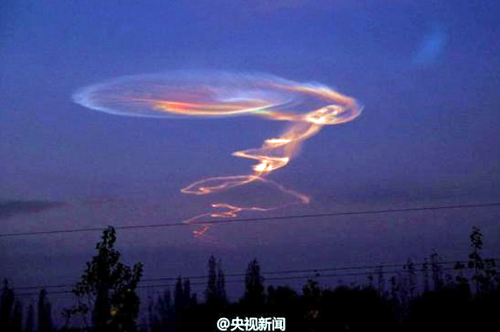 The contrails of China's DN3 test launch. Bill Gertz of the Washington Free Beacon infosite has posted an article that reports China recently carried out a flight test of a new anti-satellite missile, highlighting the growing threat of Beijing's space warfare capabilities. He notes that the flight test of the Dong Neng-3 direct ascent missile was tracked by U.S. intelligence agencies on July 23 from China's Jiuquan Satellite Launch Center in Inner Mongolia, in northwestern China, according to U.S. defense officials familiar with reports of the launch. The officials said the launch was not successful and the DN-3 appeared to malfunction in the upper atmosphere after the night launch. The launch occurred after Chinese authorities posted a notice to airlines to avoid flying near the flight path of the missile. The missile's flight was captured in photographs and video by several Chinese Internet users near the Jiuquan facility. Despite the failure, China's space warfare program is said to be advancing rapidly as an asymmetric warfare weapon that will allow a less capable Chinese military to defeat the U.S. military in a future conflict continues on the path to development. The Pentagon's annual report on the Chinese military states that in December the Chinese created a new Strategic Support Force that will unify space, cyber, and electronic warfare capabilities, with the report adding that the PLA continues to strengthen its military space capabilities despite its public stance against the militarization of space. Air Force Gen. John E. Hyten, commander of the U.S. Strategic Command and a space warfare expert, said both China and Russia are advancing space-war fighting capabilities. "China right now is ahead of Russia because they've been on a consistent path for a longer time," Hyten said in an interview in Omaha last week. Hyten said the U.S. military currently has a "very robust space capability. And the threats that we face are actually very small. However, the significant U.S. advantage in space is eroding and satellites are becoming more vulnerable to attack. "We have very old space capabilities too, very effective space capabilities, but they are very old and not built for a contested environment," Hyten added.